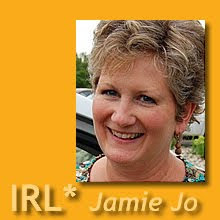 IRL*in real life with Jamie Jo: ETC. For lack of a better word, etcetera seems to sum up my excuse for not sleeping well all week. Etcetera has either kept me up way past my bedtime, or else awakened me way too early in the morning for a solid stinking week. Aside from a local missionary ladies retreat I’m helping to organize for this coming weekend and a garage sale to finally get rid of the junk I cleared out of closets and storage back in January, really not much is happening. Oh, and planning an unexpected trip to California for the summer. Ha! Like an hour goes by without that invading my thoughts. Beyond all that, it’s the etcetera that is keeping me awake at night. Too much is on my mind. My ddil’s college graduation I missed on Saturday, a dear friend’s recent miscarriage the first week of furlough-not-a-vacation, a son’s birthday today a thousand miles away, and even vain petty thoughts like who is going to cut my hair in California for an affordable price so I can look decent for another son’s Wisconsin wedding in July, and will I succeed in dropping a few extra pounds before then? As if all that weren’t enough to disturb sleep, this is the hottest month of the year in southern Mexico, which means open windows at night to draw in the cool mountain breeze. It also means dogs barking and extra noise all night long. To top it off, a neighbor just put up a huge striped tarp (picture a revival tent) across the dirt road from us. That means only one thing: PARTY. Maybe it’s the same in your country. Party in the neighborhood means bad music blaring all night long from enormous speakers, vibrating our adobe house right to the foundation. Another excuse for not sleeping. Yawn. I sure hope the upcoming retreat allows me to relax and catch up on some sleep. At the same time I hope my snoring doesn’t disturb my roommates’ sleep too much. Etc. By the way, thanks so much for those potty stories from last week. Even though they did nothing to help induce sleep, they did provide the laughs that I was seeking! I love the comments! Keep ‘em coming. You are welcome to go down to our house to sleep you know. That doesn't mean the noise will be silenced altogether but the vibrations may be slightly less and the noise dulled a wee bit. Prayers for your rest...whether that's in the form of actual sleep or not. I can relate to much of this as usual...thanks for sharing your experiences. It often helps me knowing there are others who can relate. I had an extremely difficult week last month where I felt overwhelmed with so many "etc." things and could not sleep well at all either...my brain would not turn off for anything. I can also relate to the neighbors blaring their music all hours as well...with the May 1 and Cinco de Mayo holidays, it's pretty much non-stop right now.